Social Security System (SSS) has a lending program called Assumption of Mortgage which allows a member with good standing to assume the updated principal balance of an existing SSS housing loan. —Is not more than 60 years old at the time of application. 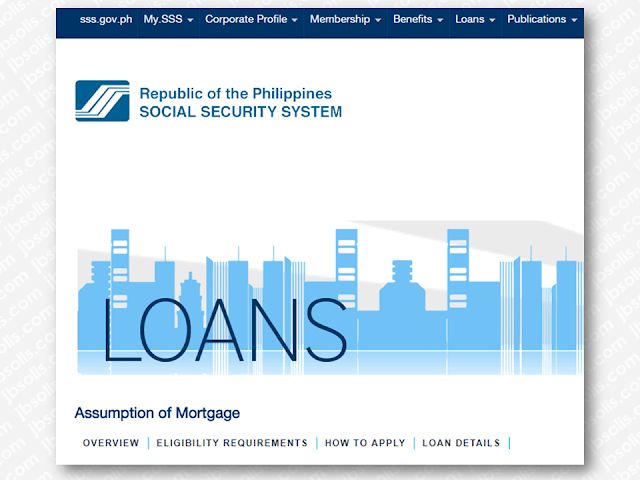 —Borrower and spouse is current in the payment of their other SSS loan(s) if any. —Affidavit of undertaking to continue paying monthly SSS Premium Contributions for the duration of loan for Voluntary and Self-employed members only. — Application Fee – ½ of 1% of loan amount or P500.00, whichever is higher but not to exceed P3,000.00, to be paid prior to journalization of the account. 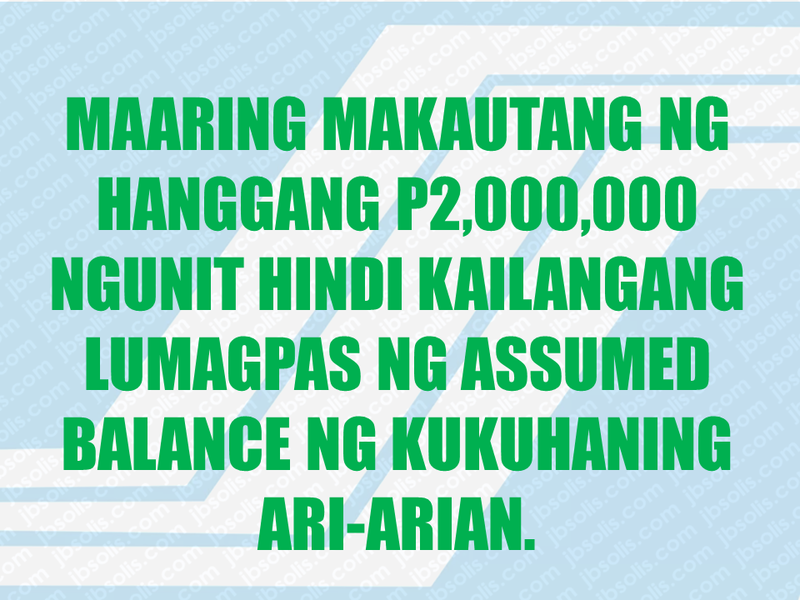 The maximum loanable amount is P2,000,000 but should not exceed the updated loan balance of the account assumed. The difference between the age of the applicant and 65. The collateral shall be the house and lot which is the subject of the mortgage to be assumed. The amount assumed is transferred to the mortgagor. A new account number will be assigned to be used in paying the monthly amortization of the loan. The regular monthly amortization payment shall start within the first ten (10) days of the succeeding month after the account has been journalized. Prior to journalization, the applicant shall continue paying the monthly amortization for the account of the original mortgagor. Any unpaid loan amortization shall bear a penalty of 1.5% for every month of delay. 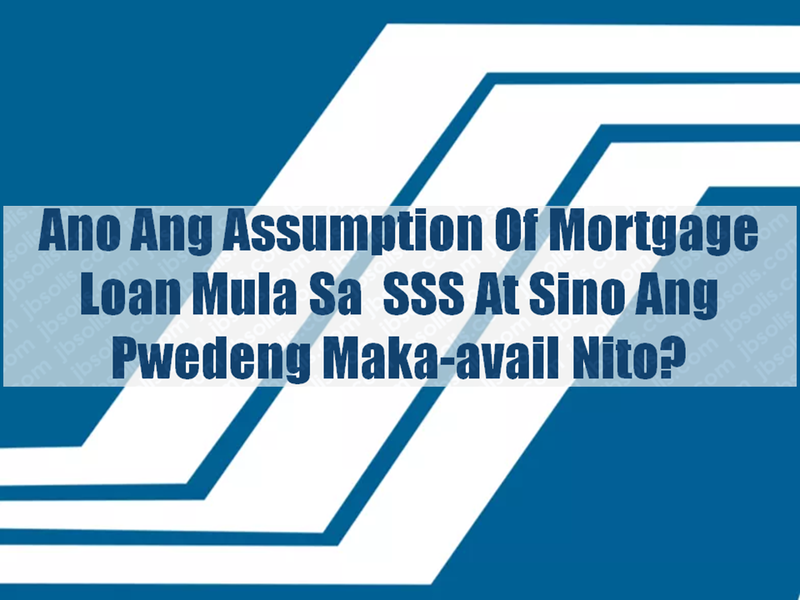 If the mortgagor fails to pay at least six (6) monthly amortizations, the SSS may immediately foreclose the mortgaged property. 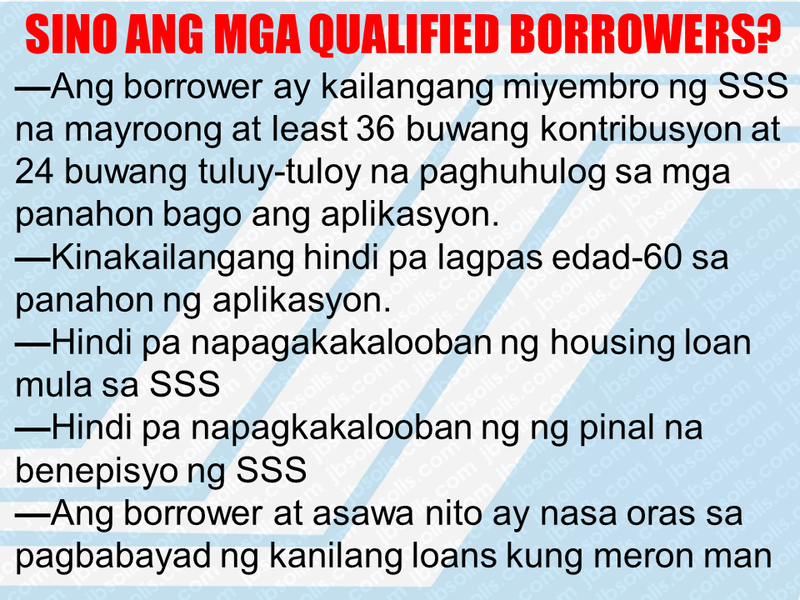 For more information contact the SSS Housing and Business Loans Department in Quezon City with telephone number 920-64-01 local 5121 to 5127 or at member_relations@sss.gov.ph or to the SSS office nearest you.